How do you know when something bad is coming? I was recently asked how prevelant tornado sirens are in the metro area and thought that would be a good discussion to have. 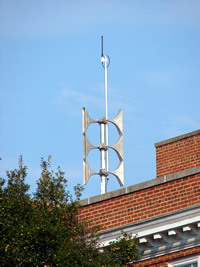 Tornado and alert sirens do exist in some municipalities in the Denver metro area but not all. Boulder has a system (primarily due to flood dangers) as does the city of Denver itself. Many of the other suburbs however do not. Unfortunately, Thornton does not which to me is somewhat odd as in 1981 Thornton was struck by one of the few tornadoes to have hit the metro area so you would think that would have caused them to consider building a system back then. If you are reading this and live in another municipality, give them a call to find out if one is available in your area. The sirens definitely do provide a service to the community. However, USA Today just had an article discussing these types of systems and pointing out that they were expensive to maintain and of limited effectiveness. Some municipalities have depended on reverse 911 systems to alert residents but it is my opinion that these to are limited because they rely on someone being home to answer the phone. What if you are in an area park and a tornado is coming? People today are very mobile and a solution that takes that into account and can warn people wherever they are would be ideal. The city of Dacono recently deployed a system that I think Thornton should give some thought to. You can read more about it here but in essence residents can sign up to receive alerts on their home phone, cellular phone and email. Within a matter of seconds, thousands of subscribers can be notified of everything from weather events to disaster updates to AMBER alerts for much less than the cost of a siren system. ThorntonWeather.com is going to be discussing the idea of this type of system with Thornton City Council members in coming weeks so be sure to check back to see what we learn. 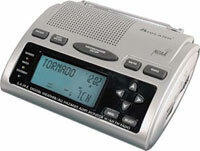 In the meantime, probably the best way to ensure you are warned about approaching dangers is to purchase what is commonly known as a “weather radio.” These radios are relatively inexpensive (around $40.00) and allow you to listen to and monitor the NOAA Weather Radio All Hazards (NWR) system. NWR broadcasts official Weather Service warnings, watches, and forecasts as well as other hazard information like earthquakes, avalanches, chemical spills, and even AMBER alerts. These broadcasts continually run 24 hours a day, 7 days a week and provide a great way to stay up to date with developing weather conditions. One of these radios is actually what broadcasts our weather radio system here on ThorntonWeather.com. Some of the nicer units even use what is called SAME – Specific Alert Message Encoding – which I would highly recommend. In essence you program in a code for the area in which you live and the radio will automatically turn on and sound an alert when something of note is in your area. These weather radios are very popular in rural areas in Tornado Alley but as we saw last week in Windsor, they definitely can be useful here along the Front Range as well. More information about the system can be found on the National Weather Service’s website and you can find these at many electronics retailers, particularly those on the Internet like Amazon or NewEgg. Which weather radio do we use? We are hesitant to recommend specific products but our radio of choice at the current time is the Midland WR-300. This radio has the important SAME coding feature, a text display to show you what sort of alert is occurring, battery backup and more. We have been pleased with the two we have. NewEgg carries this model for $47.99. This entry was posted on Saturday, May 31st, 2008 at 4:11am MDT and is filed under Colorado Weather, Natural Disasters, Severe Weather, Thornton Weather. You can follow any responses to this entry through the RSS 2.0 feed. You can skip to the end and leave a response. Pinging is currently not allowed. Most communities that are where severe weather occurs really should have some sort of a warning system. If not sirens, then high tech text messaging should be considered.